Carolina TMJ and Facial Pain Center is dedicated to successfully treating craniofacial pain, TMJ disorders and sleep disordered breathing. Our approach is a comprehensive evaluation for diagnosis and non-invasive TMJ and muscle pain treatment options. We provide diagnosis and treatment with state-of-the-art techniques and equipment in a caring, friendly environment. Patients suffering from clicking/popping of the jaw, face pain, migraines, ringing of the ears, loud snoring, or those who suffer with difficulty tolerating CPAP should contact Carolina TMJ & Facial Pain Center to learn more. 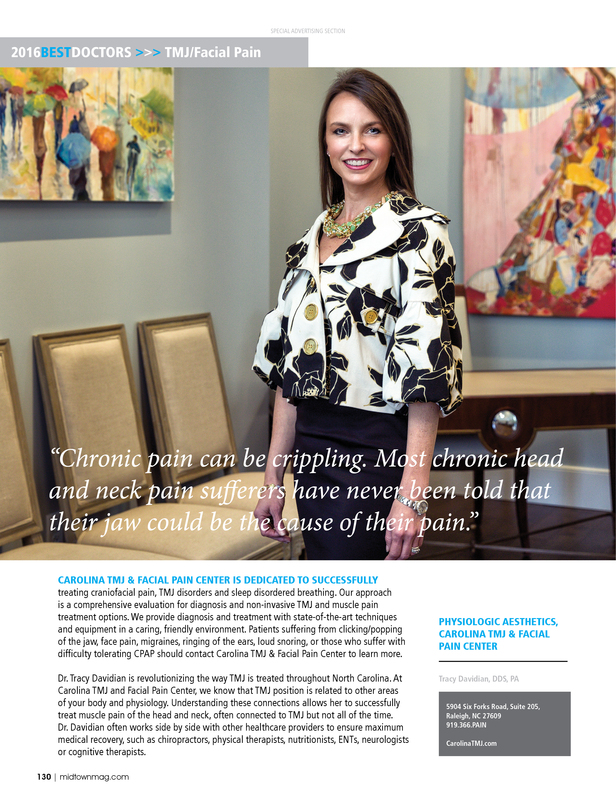 Dr. Tracy Davidian is revolutionizing the way TMJ is treated throughout North Carolina. At Carolina TMJ and Facial Pain Center, we know that TMJ position is related to other areas of your body and physiology. Understanding these connections allows her to successfully treat muscle pain of the head and neck, often connected to TMJ but not all of the time. Dr. Davidian often works side by side with other healthcare providers to ensure maximum medical recovery, such as chiropractors, physical therapists, nutritionists, ENTs, neurologists, or cognitive therapists.